We have Great Horned Owls throughout the Foothills area. I have heard them annually as long as I have lived in the Foothills but I have rarely seen them and never seen a nest. 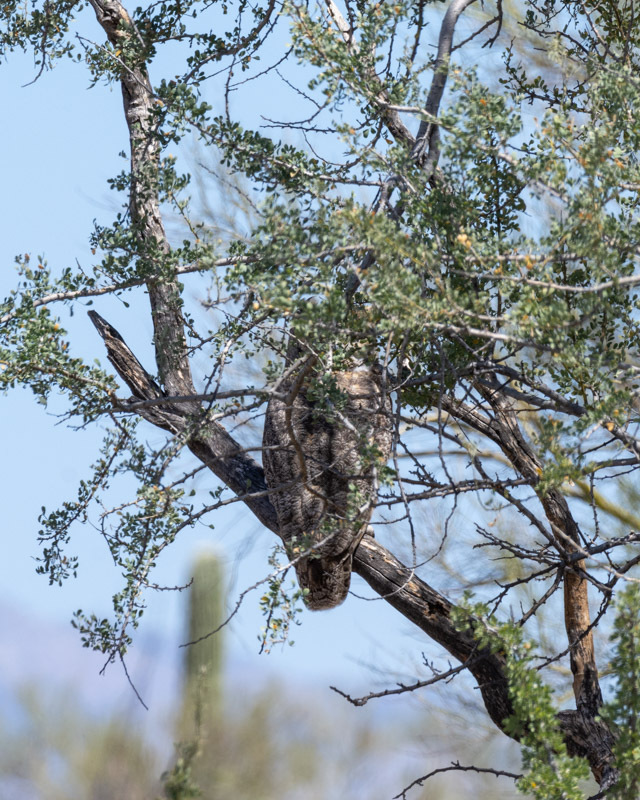 For the first time ever, I have been fortunate to learn about several Great Horned Owl nests in the Tucson area. Here is my first update of how these wonderful birds are doing. 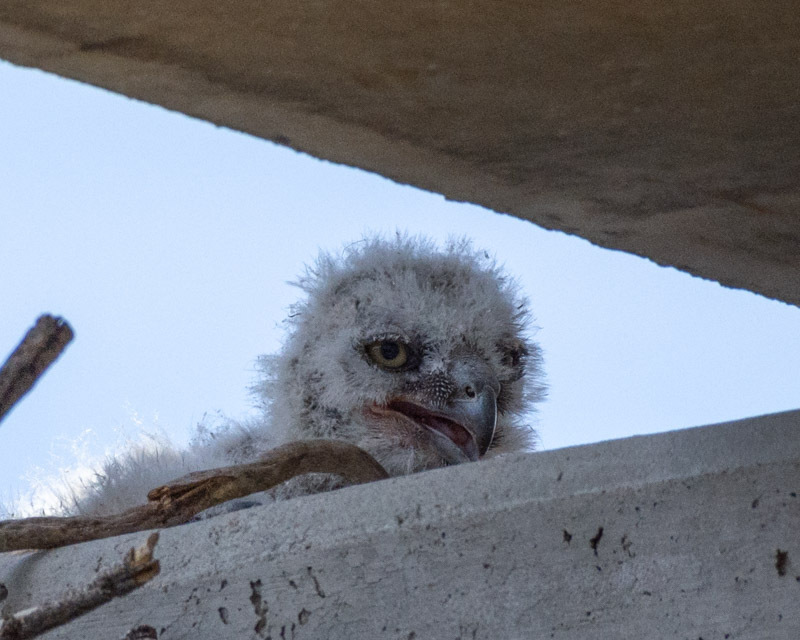 I hope to have further updates as the season progresses and the owlets grow up. First is the owl on a nest in my Foothills Clusters neighborhood. A pair of birds have requisitioned an old Cooper’s Hawk nest atop a pine tree. Mom is sitting on the eggs daily while Pops usually sits in a nearby Palm Tree where he can watch the nest and provide protection if needed. 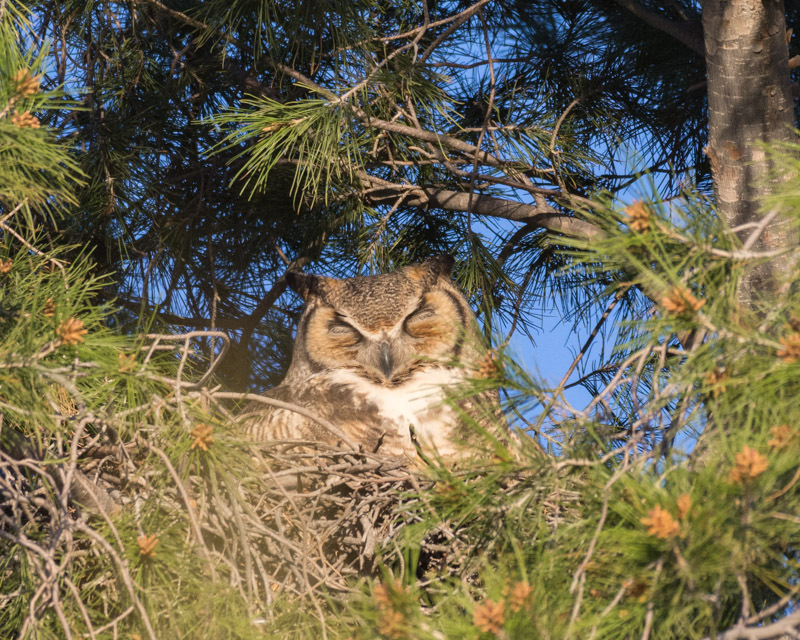 Even in the bright, direct sunlight, the owl can catch up on sleep. According to my calculations, the babies should hatch any day now. Let me know if you have Great Horned Owls in your neighborhood! 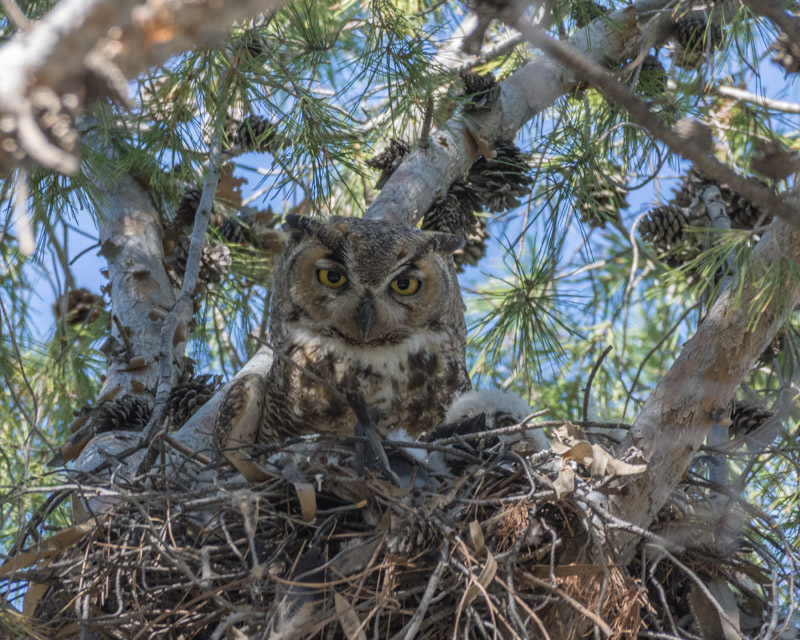 Great Horned Owls do not build their own nests. They will use old, abandoned nests built by other large birds such as ravens or hawks, or they may use cavities in trees, deserted buildings, cliff ledges or even plain platforms. They may line the nests with shreds of bark, leaves, fur or feathers from prey, or even their own feathers. Or, they may add no lining at all. 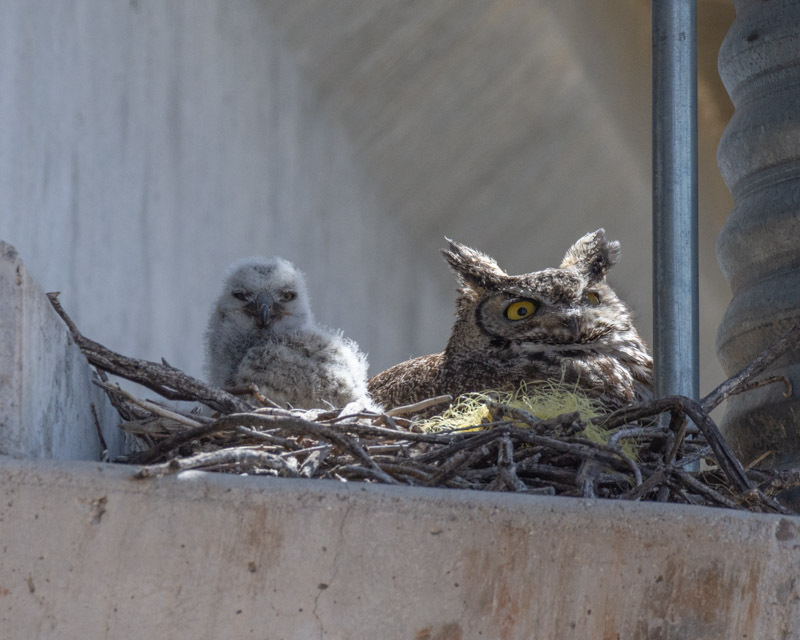 A friend showed me another Great Horned Owl’s nest in mid-town Tucson. 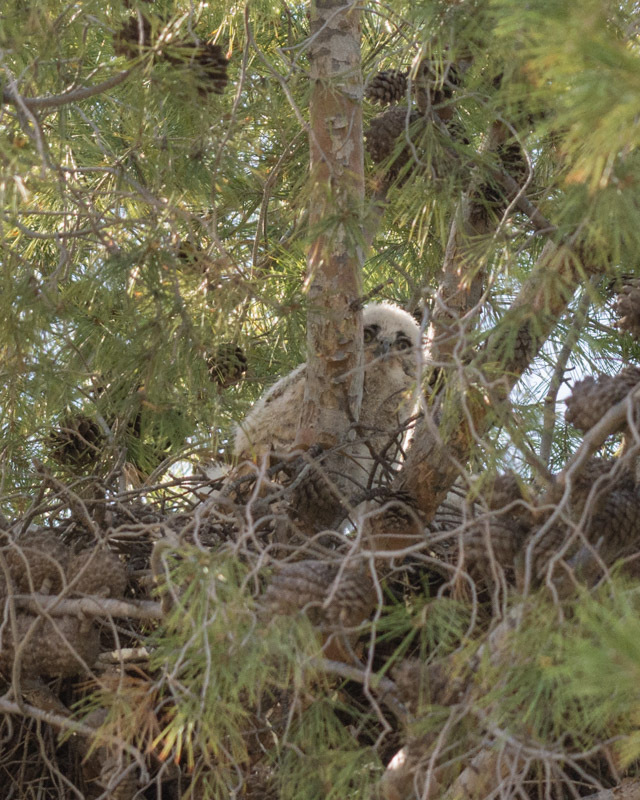 It was also high up in a pine tree and the mother was clearly visible and watching her environment. See the head and eye of a little fuzz-ball to the right of her? Here one owlet stood up to survey the action far below the nest. 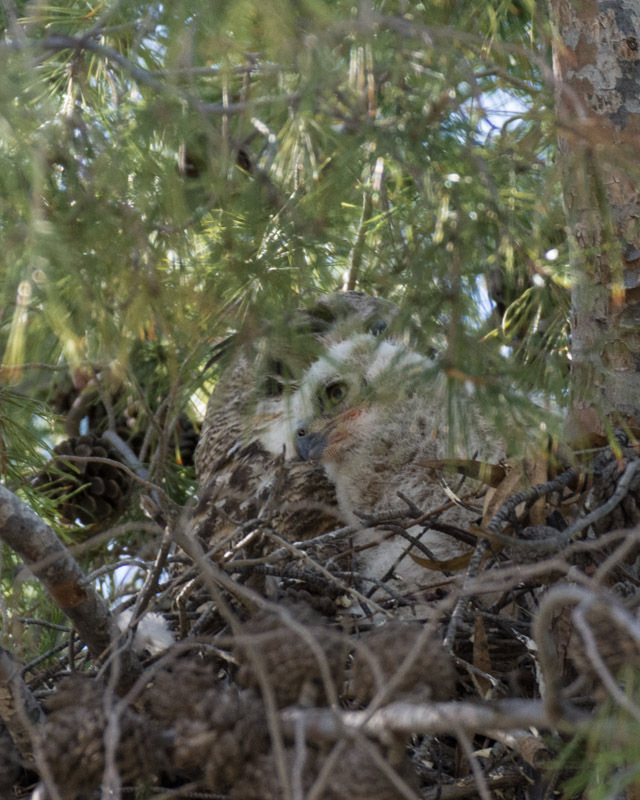 We could see two owlets on the nest. Deeply hidden among the pine needles, the mother and chicks appear very well sheltered. 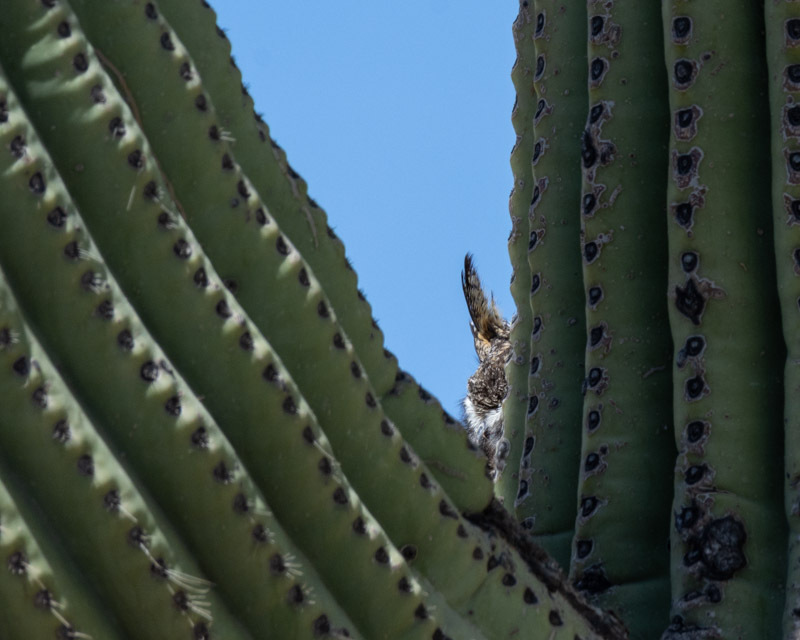 I have always wanted to see a Great Horned Owl nesting in the arms of a saguaro. Through a friend, I was led to one on the west side of Tucson. The nest is barely visible from a distance. Here is a sense of size of the nest. This may have been an old nest of a family of Harris’s Hawks. 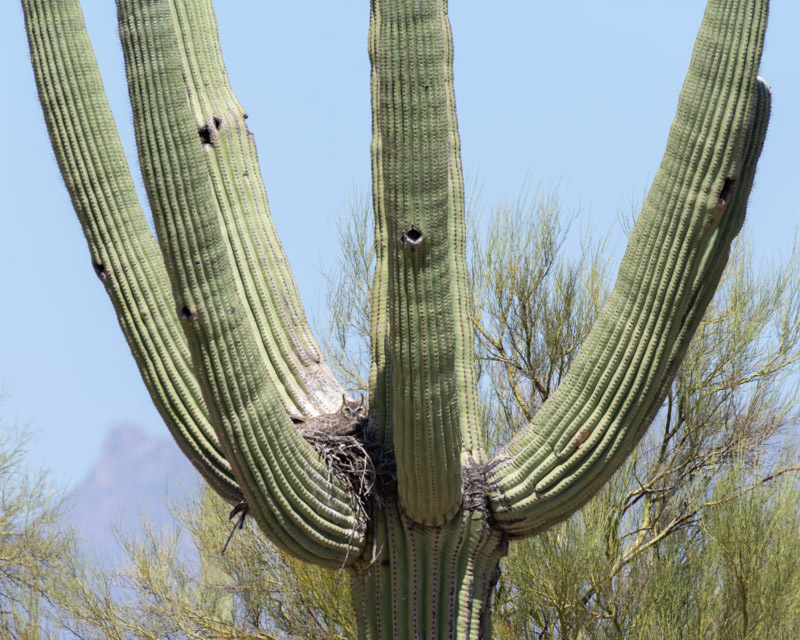 The saguaro arm just beyond the nest is covered with whitewash, so there may have been many hawks using this spot. A close-up of Mom. No sign of chicks yet. It was a very windy afternoon. She was facing into the sun and the wind was blowing her ‘plumicorn’ feather tufts. 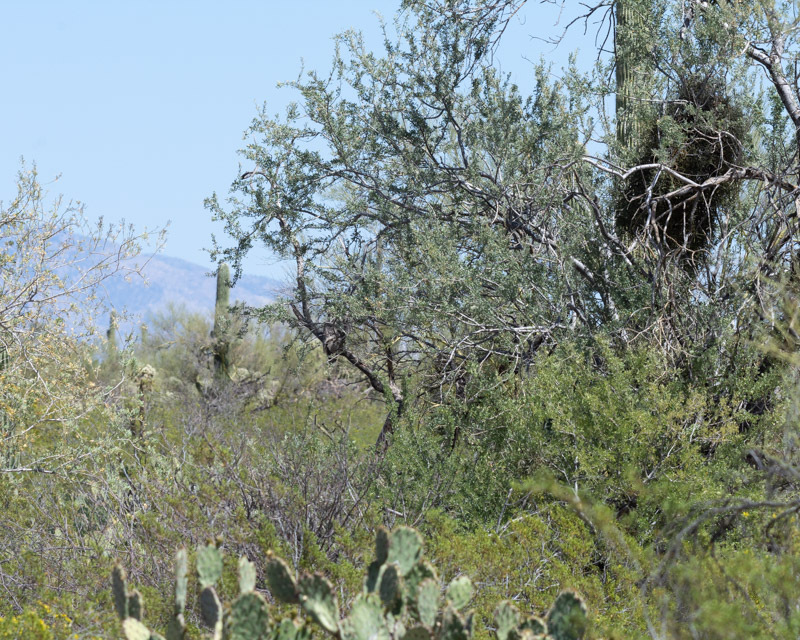 The male Great Horned Owls usually perch close-by and within sight of the nest. This male flushed from a neighboring Ironwood Tree and landed in a nearby Palo Verde. Can you see him? How about now? We left as soon as he flushed and landed. 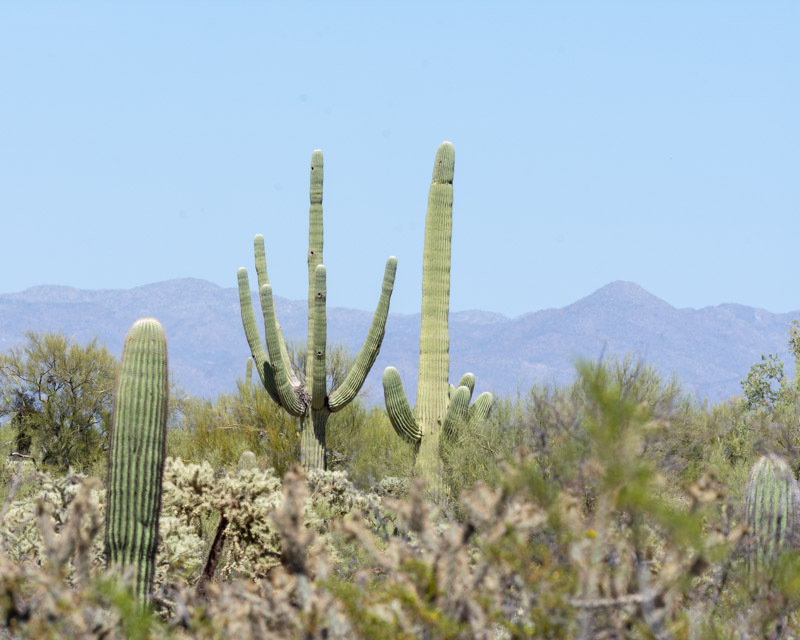 I returned to a nest north of Tucson that I have visited in the past. You may remember a recent photo of the female on her nest. 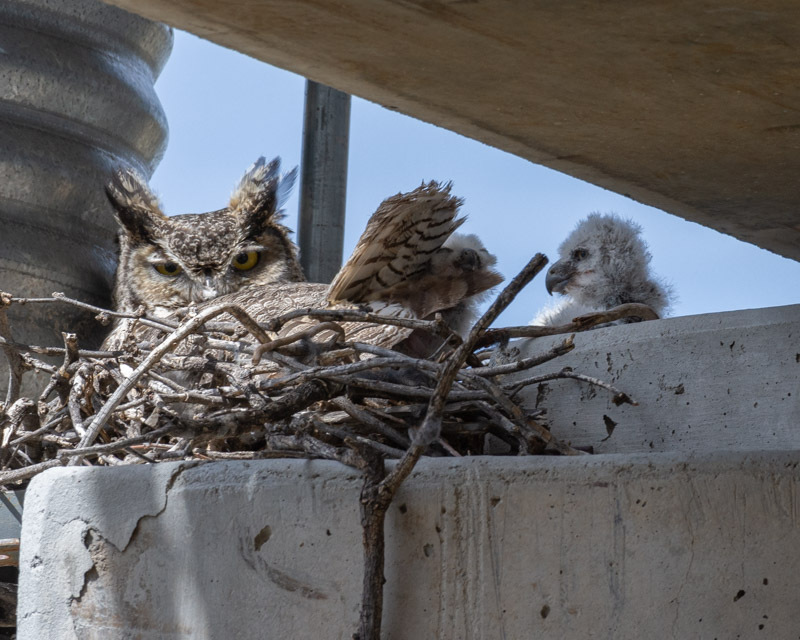 Two owlets are now present. Only one popped up for its photograph. From the other side of the nest, Mom is always alert and the baby shows its impressive profile! So two nests with owlets, and two nests waiting. 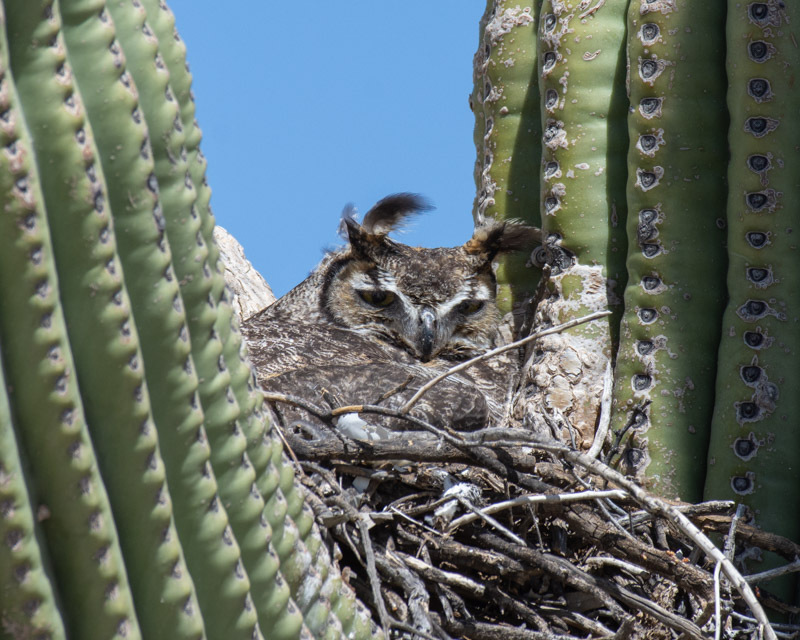 From the Arizona Breeding Bird Atlas: The female Great Horned Owl alone incubates and broods the young. Incubation lasts from 30-37 days. Once the babies hatch, the male brings food to the nest while the female remains on the nest, tearing the food for the young. 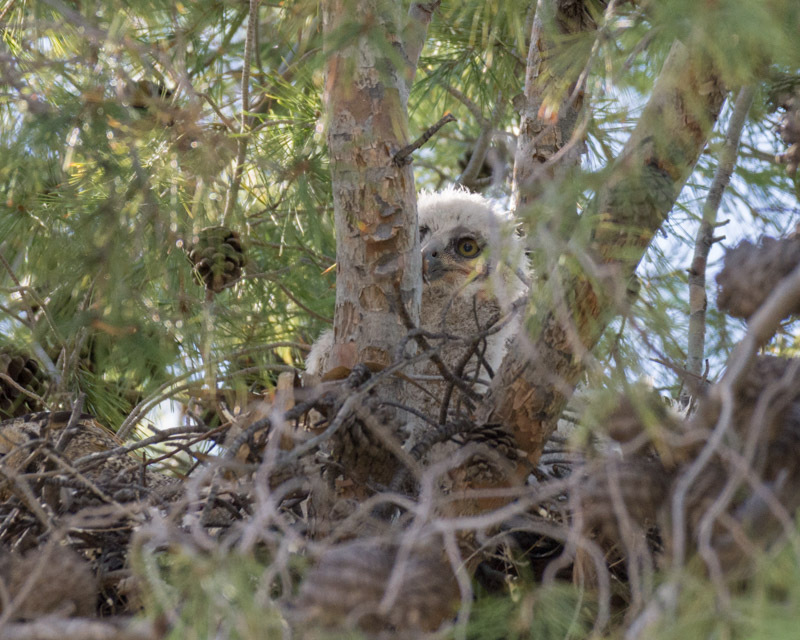 Young owlets will leave the nest at 5-7 weeks of age but are incapable of sustained flight for several more weeks. Fledglings will remain near the parents all summer and may continue begging for food even 4-5 months after leaving the nests.